Many thanks to David Gordon for sending me a copy of Tracks by Mike Gordon for reviewing; Tracks is a self-published book and is Mike Gordon's first novel. "The future of the surveillance society… In Boston, Global HealthCare Corporation is hoping to recover its fortunes with a new micro-chip technology which can eradicate disease - until Peter Miller, the brilliant but troubled architect of the program, quits his job and goes to work at a psychiatric hospital in London, helping develop a system to track dangerous patients. When a deadly threat to the US emerges, a covert Federal agency becomes involved, and Miller is caught up in a web of lies, love, insanity and murder - and finds he's opened the door to a frightening future." Currently I am about halfway through the book and I have to say that I like it - the story is gripping, there are some interesting characters and it is well-written: a review will appear here when I have finished the book. 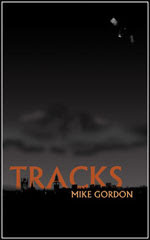 Anyone wishing to support a new, self-publishing author can buy Tracks from the book's website: Tracks by Mike Gordon.